Jan 2, 2015 In: To Do List Tags: Capital Gallery, Chloe Sellis, Cynthia Daignault, Desiree Holman, FOG Design + Art Fair, Gallery Wendi Norris, Hannah Whitaker, Imin Yeh, KALA Art Institute, Kara Maria, Lorenzo Vitturi, Matthew Goldberg, Pier 24 Photography, Ranu Mukherjee, Recology San Francisco, Stephen Gill, Virginia Overton, Will Rogan, Yamini Nayar By: ArtSource Inc.
Top: Desiree Holman, ‘Aura Convergence, Crowley & Cayce’, gouache on paper. 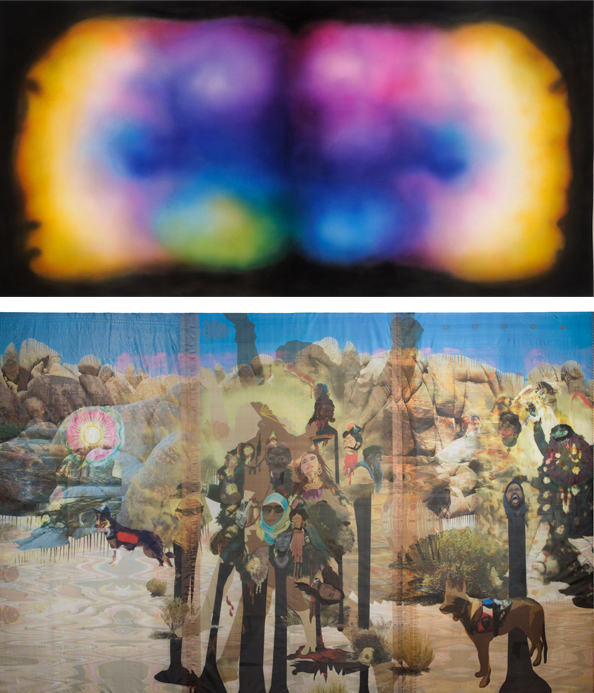 Bottom: Ranu Mukherjee, ‘Desert Bloom – Models, Protesters, Service Dogs’, ink on silk. Images courtesy of Kala Art Institute. January 15th – March 21st, Seeing Time – Time Traveller, at Kala Art Institute & Gallery: Closing Kala’s 40th anniversary year, Seeing Time – Time Traveler invites Kala Fellowship Alumni to return for a special exhibition. Participating alumni include Freddy Chandra, Desiree Holman, Ranu Mukherjee, and Yasuaki Onishi. Visual chronology of Kala’s milestones designed by Sara Lankutis and Scout Sheys will be also on view in the exhibition. In addition to the gallery exhibition, various prints, drawings, and works on paper representing over 2,500 Artists-in-Residence (AIR) from the Kala Collection will be featured in the Mercy & Roger Smullen Print and Media Study Center. Opening Reception is Thursday, January 15th, 6-8 pm, 2990 San Pablo Avenue, Berkeley. Last year’s entrance to the FOG Design + Art Fair. Image courtesy of Joseph Driste. 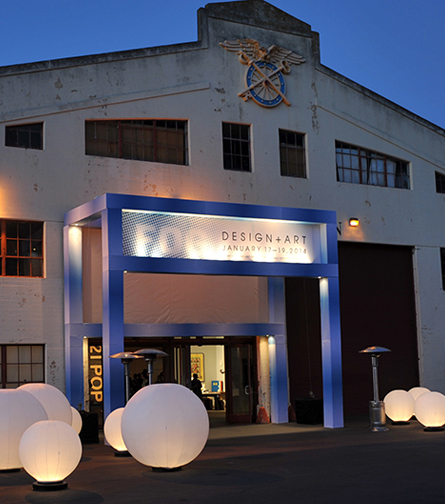 January 15th – 18th, FOG Design + Art Fair, at Fort Mason Festival Pavillion: In it’s second year, this fair features important 20th-century and contemporary design dealers from across the US and beyond, as well as a selection of leading modern and contemporary art galleries. Furniture, fine art, and design objects representing design movements from the last century to today are presented in the Festival Pavillion at Fort Mason. Preview Gala Benefiting the San Francisco Museum of Modern Art is Wednesday, January 14, 6–10 p.m. Fair hours are Thursday – Saturday, 11 am – 7 pm and Sunday 11 am – 5pm. January 15th – February 28th, The Return to Reason, at Gallery Wendi Norris: This group exhibition is curated along with Allie Haeusslein of Pier 24 Photography, and is Gallery Wendi Norris’s first exhibition devoted solely to photography. Featuring works by Stephen Gill, Yamini Nayar, Chloe Sellis, Lorenzo Vitturi and Hannah Whitaker where the act of layering plays a fundamental role in shaping the final result. Opening Reception is Thursday, January 15th, 6-8 pm, 161 Jessie Street, San francisco. 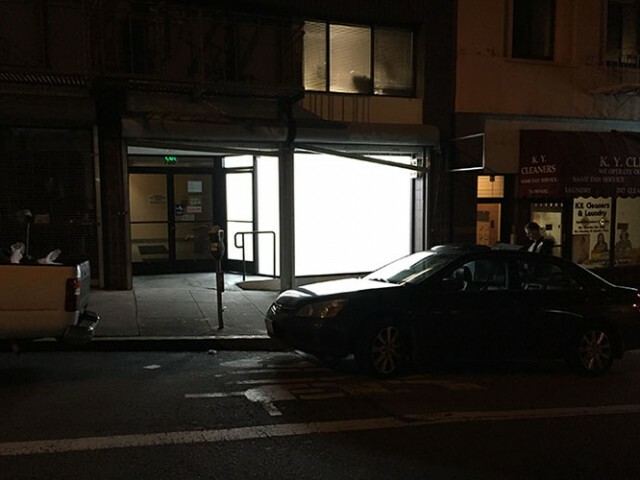 The storefront of Capital Gallery in Chinatown. Image courtesy of Capital Gallery. January 23rd – February 28th – Touch The Spindle, at Capital Gallery: This three-person exhibition marks the opening of Capital Gallery in San Francisco’s Chinatown. Featuring Cynthia Daignault, Virginia Overton and Will Rogan. “If we could hold this show up to the light and look into the magical glow where reality and fantasy disappear, where the familiar and everyday become altered and materiality makes a strange and twisted transformation. Where a visual prick could cast a spell into a world of warped perception, questions about mortality and/or a visual kiss could awaken you from a surreal slumber. If we could manipulate this exhibition, exorcise it like an object and allow the viewer to be romantically moved, we most definitely would.” ~ Capital Gallery. Opening Reception is Friday, January 23rd, 6-9 pm, 716 Sacramento Street, San Francisco. Top to Bottom: Kara Maria, Imin Yeh, and Matthew Goldberg in the Recology studios. Images courtesy of Recology San Francisco. January 23rd, 24th, and 27th, Kara Maria, Imin Yeh and Matthew Goldberg, exhibition receptions at Recology San Francisco: The Artist in Residence Program at Recology San Francisco is a one-of-a-kind program established in 1990 to encourage the conservation of natural resources and instill a greater appreciation for the environment and art in children and adults. Artists work for four months in studio space on site, use materials recovered from the Public Disposal and Recycling Area, and speak to students and the general public. 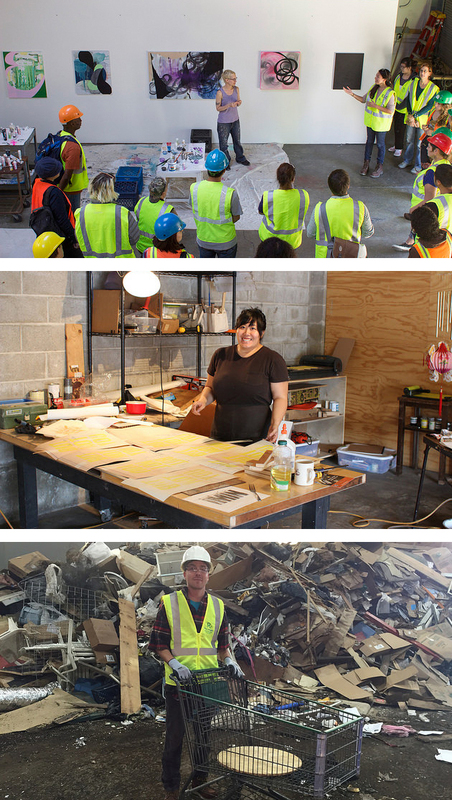 These exhibition receptions feature work from the current artists-in-residence Kara Maria, Imin Yeh and student artist Matthew Goldberg and is the culmination of four months of work by the artists who have scavenged materials from the dump. Opening receptions are Friday, 1/23 from 5-9 pm, Saturday 1/24 from 1-3 pm and additional viewing hours on Tuesday 1/27 from 5-7pm. The art studio is located at 503 Tunnel Avenue.